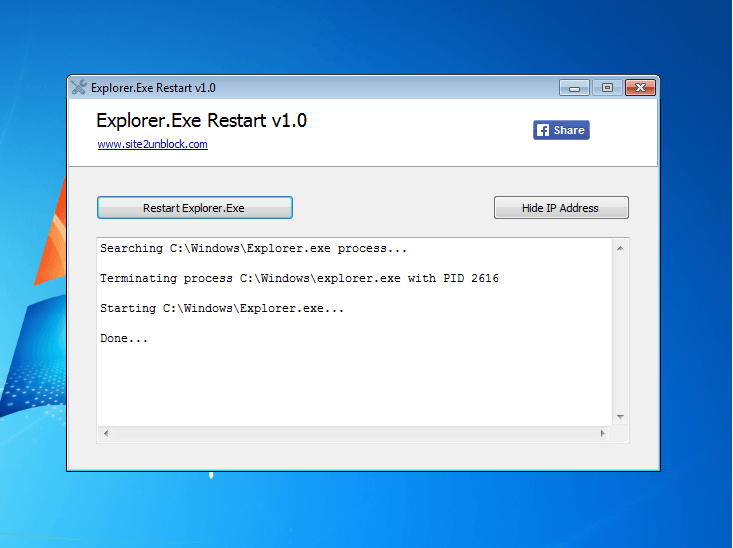 Explorer.Exe Restart is a very simple Windows OS software that helps you to quickly restart the C:\WINDOWS\Explorer.exe process. If you are experiencing problems with a program that needs to integrate with Explorer, or if you need to refresh some system settings that require Explorer to be restarted, then this simple program is what you need. Generally, restarting Explorer can fix some Windows-related problems (like a program freeze, Sandboxie-freezes, icons cache problems, etc), avoiding the need to reboot the PC. This program works on Windows XP, Vista, 7, 8, 8.1 and Windows 10 (32\64-bit). Simple Interface, Just Click the Button "Restart Explorer.Exe"